Bilbo (Martin Freeman), Gandalf the Grey (Ian McKellen), Thorin (Richard Armitage), and companions continue their quest to The Lonely Mountain in The Hobbit: The Desolation of Smaug, the second installment in Peter Jackson’s Hobbit trilogy. The last time we saw Bilbo and his friends, 2012’s The Hobbit: An Unexpected Journey, they narrowly escaped the Pale Orc aka Azog the Defiler by flying away on giant eagles. Luckily, Desolation of Smaug picks up right where the last film left them – Gandalf is leading the group towards The Lonely Mountain while they’re still being pursued by orcs. Their quest sends Bilbo and the group into the dark and mysterious Mirkwood forest while Gandalf heads to the mountains. Lost in the Mirkwood forest, the group encounters Wood-elves Tauriel (Evangeline Lilly) and Legolas (Orlando Bloom). After being captured by the Wood-elves, Bilbo helps the dwarves plan a harrowing escape that leads to an encounter with Bard (Luke Evans), a Lake-town man who helps them finish their quest into the mountain. 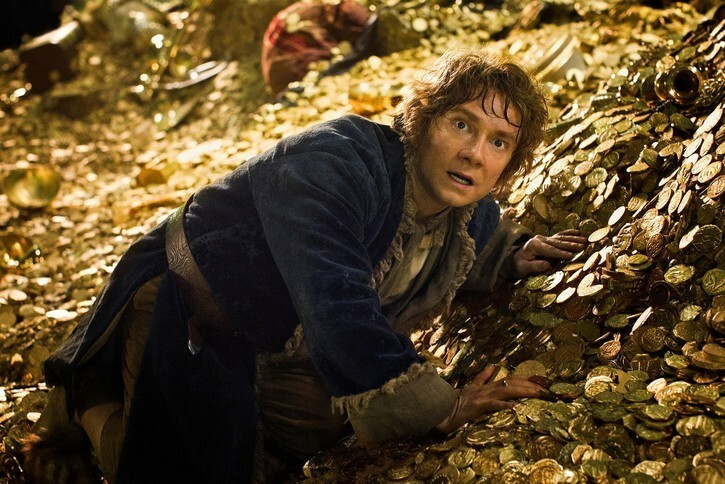 The Desolation of Smaug isn’t a suspenseful fantasy story that’s going to keep moviegoers guessing. It’s nearly impossible since the story is 80 years old, and the story precedes one of the biggest movie franchises of all time (see: Rings, Lord of the). Spoiler Alert – There’s a scene when Bilbo “loses” the ring, but we know he doesn’t lose the ring because there’s an entire franchise built on Bilbo giving the ring to Fordo. The Hobbit purist may have a trouble with a few minor changes, but it’s hard to argue with how amazing the spiders in the Mirkwood forest are, the wine barrel river escape scene being one of the film’s best action sequences, or how frightening Smaug looks. Jackson does a masterful job recreating some of these iconic scenes. Creating a Middle-earth that fans approve of is no easy task. The best recreation Jackson pulls off is Bilbo’s encounter with Smaug (voiced by Benedict Cumberbatch). A dragon resting on top of a pile of gold, like Scrooge McDuck, while speaking with an intellectual charm was more entertaining that I would’ve imagined. Despite the unnecessarily long runtime (161 minutes), The Desolation of Smaug is an enjoyable film. I’m sure people will find ways to nitpick the film but it’s a fun fantasy adventure with a lot of action. It’s moves at a faster pace than An Unexpected Journey but maintains the heart of the Hobbit narrative that fans are attached to. Peter Jackson has treated fans of The Hobbit and LOTR to an early Christmas gift they’re sure to love. Posted in Uncategorized and tagged action adventure, Bilbo Baggins, Desolation of Smaug, Evangeline Lilly, Gandalf, Grade: B, Hobbit, Ian McKellen, Lonely Mountain, Martin Freeman, Mirkwood, Orlando Bloom, Smaug. Bookmark the permalink.